Oil States’ Hydra-Lok™ pile swaging system is designed to make structural connections for offshore platform jackets to their driven foundation piles. The system can also be used to make structural connections in subsea drilling template, wellhead protection structure, and manifold, tripod, monopile and wind turbine jacket applications. 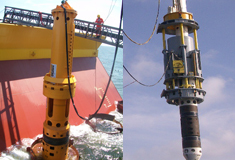 This unique Hydra-Lok pile swaging technology is Lloyds Register and DNV approved, and it has since been certified by Bureau Veritas, American Bureau of Shipping (ABS) and the Russian Maritime Register of Shipping (RMRS). See Hydra-Lok swaged connection systems animation here. Real-time verification of connection formation and immediate full-strength capacity. Certified authority approved (Lloyds Register/DNV approval).